With summer winding down and the kids back in school, we only have one thing on our minds: Fall produce and spices! Our butternut squash and pear soup is elevated by crisp oven-baked Moroccan spiced chickpeas. These are added at the last minute and can be omitted for kids or anyone avoiding spicy foods. The hot soup and exotic spices offer warmth and comfort. A perfect dish to get into the Fall spirit. If using, make the Moroccan spice mix by combining all of the ingredients and mixing well*. Place the rinsed chickpeas on a clean tea towel and gently pat dry. Discard any loose skins. In a mixing bowl toss the chickpeas with the olive oil and spice mix, stirring well until chickpeas are completely coated. Arrange chickpeas on a sheet pan lined with parchment, making sure to spread them out evenly. Bake chickpeas for 20-25 minutes, or until brown. Remove from the oven and let cool for 10 minutes. Set aside. While the chickpeas are baking, start making the soup. Place a large pot over medium heat, then add olive oil to warm. Add onions, sage and a pinch of salt. Stir to coat in the olive oil, and sauté until the onion softens and becomes translucent, about 5 minutes. 10.Add butternut squash and vegetable stock. Bring to a boil. 11.Lower the heat and simmer uncovered for 15 minutes. 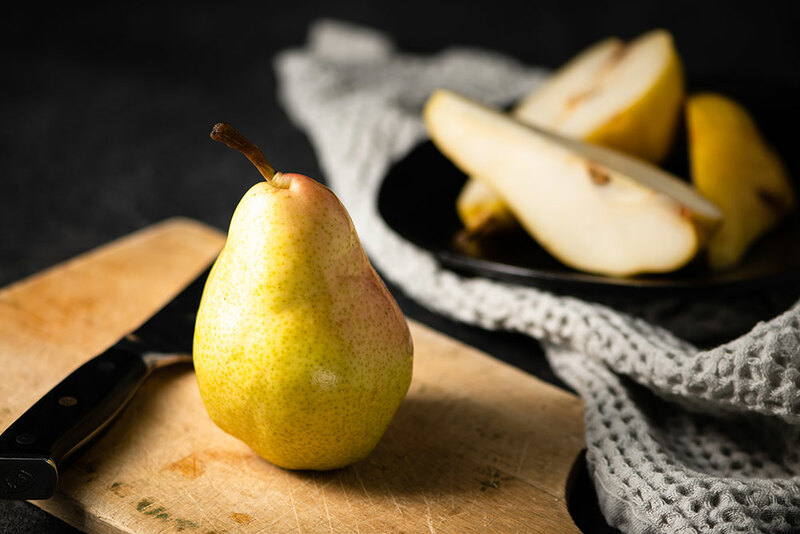 12.Add the pear and simmer for an additional 15 minutes, or until the squash and pear are tender all the way through. 13.Add the salt and pepper and stir. 14.Transfer to a blender, or use a hand blender, and blend until the soup is smooth. 15.Taste and adjust seasoning if necessary. 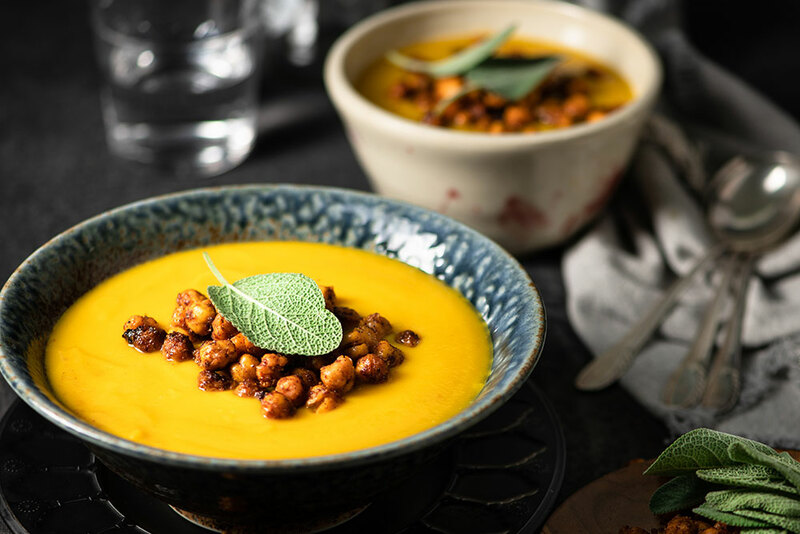 16.The butternut squash and pear soup should be served hot, topped with the spiced chickpeas (optional) and a sage leaf for decoration. *Leftover Moroccan spice mix can be placed in an airtight container and kept in a cool dry place for up to a month. It works well in marinades, on roasted or grilled meats and vegetables, or sprinkled on popcorn for a dash of spice. **Leftover spiced chickpeas can be refrigerated in an airtight container for 3-4 days. Re-crisp in a 350°F / 175°C oven for 10 minutes. I made this for a dinner party my husband and I had. The guests loved it. I’m definitely going to make this one again. A friend of mine just shared this recipe, thanks E, I”ll give it a shot.